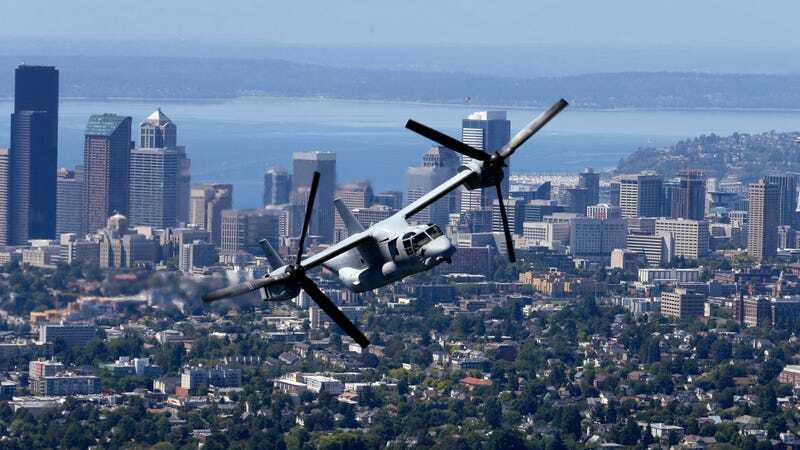 The MV-22B Osprey aircraft is just one form of a so-called flying car. The flying car has been just a few years away for, well, years. The predictions aren’t getting more optimistic under President Donald Trump, but now science is offering a surprising new reason for us to make flying cars a reality: We might need them to fight climate change. A study released Tuesday in Nature Communications explores the greenhouse gas emissions associated with these emerging electric vehicles, which are more formally called vertical takeoff and landing aircraft. The long and short of it is that flying cars can emit fewer greenhouse gases than the ground-based vehicles we drive around today, but that really depends on how far the vehicle is traveling and how many people are riding along. The research team from the University of Michigan’s Center for Sustainability Systems specializes in studying emerging technologies like wireless chargers, autonomous cars, and now, these aircraft prototypes. The team didn’t look at one specific flying car prototype; they developed a base parameter using emissions and energy use data included in academic literature available for all types of prototypes. The researchers worked out that any trip shorter than 21 miles is an automatic fail for the flying car sustainability-wise. The energy required to help the vehicle takeoff and ascend is too high to justify a short-distance ride. That’s why the authors also suggest keeping low elevations during cruise—to minimize the power used to propel the vehicle into the sky. He and the rest of the team found that trips longer than 62 miles with just a pilot would result in greenhouse gas emissions that are 35 percent lower than the emissions from gas-powered cars taking comparable trips. However, the lack of passengers still isn’t enough to make these aircraft more sustainable than electric vehicles: That ride would still emit 28 percent more greenhouse gases than an electric car with a single passenger. These numbers change, however, when more people are added to the vehicle. A fully loaded flying car with three passengers results in 52 percent less greenhouse gas emissions than a gas-powered car and 6 percent lower emissions than an electric vehicle with the average 1.54 people per ride. And the researchers believe that a fully loaded flying car used for ride-sharing would be the smartest way to integrate them into our society. That way, businesses are making the most bang for the buck, and consumers are getting a quicker ride. These flying cars can cover 62 miles in roughly a half hour—and 82 percent shorter trip than ground-based cars, per the study—because they’re fast and don’t deal with traffic the way regular cars do. Much as is the case for electric cars, emissions from actual use of the flying car will depend on how clean the grid is. The study’s main estimates are based on the projected U.S. 2020 average grid mix (34 percent coal, 28 percent natural gas, 19 percent nuclear, 8 percent hydro, 8 percent wind, and 3 percent other), but the authors also take a look at how flying cars would do regionally—for instance, running off California’s more renewable grid. Under that scenario, emissions from flying cars drop another 52 percent. But with the fossil fuel-heavy Central-and-Southern-Plains grid, emissions spike another 41 percent. Here’s how an artist envisions the future of flying cars to look like.